Always a Beverage Close at Hand: What Are Americans Drinking? The “Got Milk?” ad campaign was retired in 2014 after a twenty-year run. That’s too bad, because according to data from The Hartman Group’s Modern Beverage Culture 2018 report, fresh dairy milk is the number one type of beverage today’s consumers say they regularly drink, at least once a month or more. Celebratory, functional, nourishing, quenching. Is there anything more intertwined in America’s contemporary food culture and lifestyles than the role of beverages? Not only do they provide basic sustenance, they serve as an expression of our tastes and values. Beverage-consumption rituals can bring people together or provide solace in quiet, solitary eating occasions. Beverages are dramatic disruptors in today’s food and beverage marketplace. New categories, brands and formats have captured the attention of consumers of all ages and lifestyles and are breathing new life into both retail and food service sectors. Beverages have acquired vast amounts of real estate — on shelves and in key demand spaces — as producers and purveyors expand their offerings to meet consumers’ evolving needs and desires. Beverages are so vital to consumers’ everyday lives that the majority always have a drink with them. 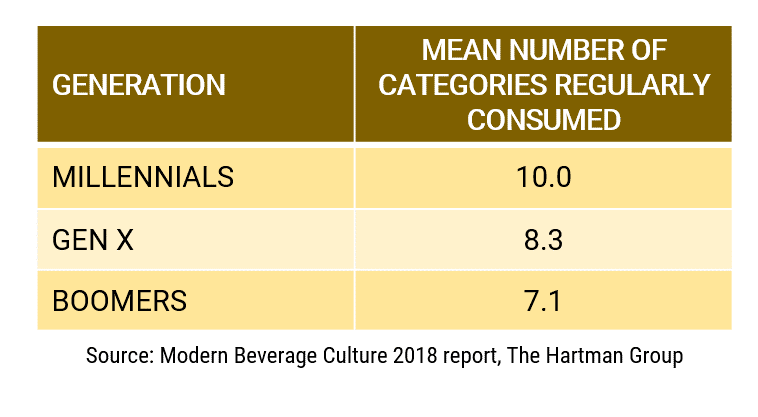 Modern Beverage Culture 2018 finds that 65% of consumers always have a beverage on hand, including 73% of Millennials, 63% of Gen X and 58% of Boomers. In addition to the emergence of entirely new categories, traditional categories have segmented into an array of distinct subcategories. As the following table shows, consumer participation across beverage categories varies by age, with Millennials regularly consuming more categories than older consumers. The combination of relaxed norms around eating and drinking and the increased importance of health and wellness in our food and beverage choices has expanded the roles that beverages play in our everyday lives. 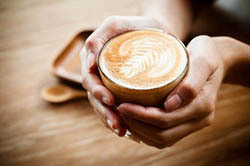 At the same time, beverages are such a constant part of our daily routine that their consumption often goes unnoticed. What are Americans drinking? 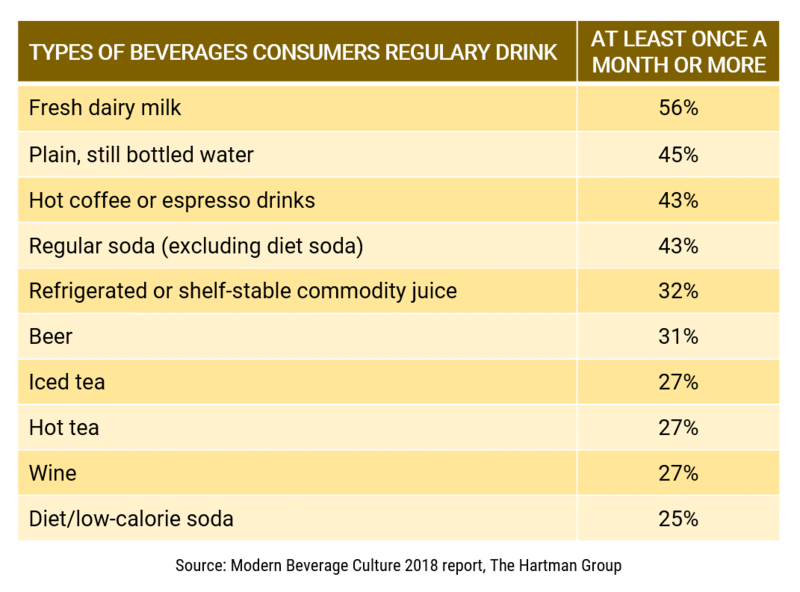 Modern Beverage Culture 2018 finds that the most popular beverage preferences are fresh dairy milk (56%), plain, still bottled water (45%), hot coffee or espresso (43%) and regular soda (excluding diet soda) (43%). The following table depicts the top preferences for beverages Americans regularly drink. Beverages included in each category reflect consumer perceptions and occasions as opposed to industry definitions. Beverages today represent the epitome of consumer choice — a vast array of options to meet demand for better solutions against evolving needs and lifestyles. It’s a complex, compelling landscape full of strategic implications for manufacturers, retailers and restaurant/food service operators alike. Modern Beverage Culture 2018 unpacks the dynamics that drive consumer choice and shape the exciting opportunities ahead in today’s beverage landscape. 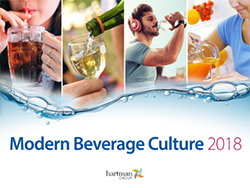 The Hartman Group’s Modern Beverage Culture 2018 report has the latest data, insights and implications about who is drinking what in America today. Included in the report is a set of category dashboards with data, facts about the most important need states, categories regularly consumed, aspirations, emerging need states and implications for opportunities. Download overview and order form.